Update: If you are using Ubuntu 8.04 LTS “Hardy Heron” or Ubuntu 8.10 “Intrepid Ibex”, use the packages in the PPA of the Ubuntu Emacs Lisp team, instead of the packages referenced here. For Ubuntu 9.04 “Jaunty Jackalope” and newer, use the packages in Ubuntu repositories. Emacs is my editor of choice. In fact, I should say it’s my framework of choice, but that’s for another post. Until recently, I disliked the poor font backend of Emacs. So, I was always using Emacs within a terminal window to get a decent looking interface. However, this grungy font era is over, since Emacs’s hackers added recently to my favorite editor a XFont backend, thus making possible to use good looking fonts, like Bitstream Vera Sans Mono. If you are running Ubuntu 6.10 (Edgy Eft) or the current development version of Ubuntu (Gutsy Gibbon), change feisty for edgy or gutsy. Now, you need to specify the font you want to use in your Xresources file. Here, I use the default monospace font, but any other monospaced font should work too. For example, if you want to use Lucida Sans Typewriter instead, change Monospace-10 for Lucida Sans Typewriter-10 in the above command. And that’s it! Now, launch Emacs and enjoy the good looking fonts. If you need support with the package, just email me at alexandre@peadrop.com. Update: Il y a, maintenant, une version en français de ce guide sur le wiki de Ubuntu-fr. Thanks very much for these pretty packages! Much easier on the eyes. Google didn’t turn up much, unfortunately. PS I can see you’re trying to keep your blog design clean (and very nice it is too). But it would still be enormously useful to have some guidance about what sort of special characters, markup, or markdown should be employed in comment boxes. It’s particularly worrying when it comes to entering code or sample output, which often contain characters that need to be escaped. I am not sure what is the cause of that error. I just tested it and the built went perfectly fine. However, I did found some executables remaining in my source tarball (Oops). Although, it very unlikely that is the cause of the error. If you want, I wouldn’t mind to host your package in my repository. Just e-mail me your patch and I will build it for you. 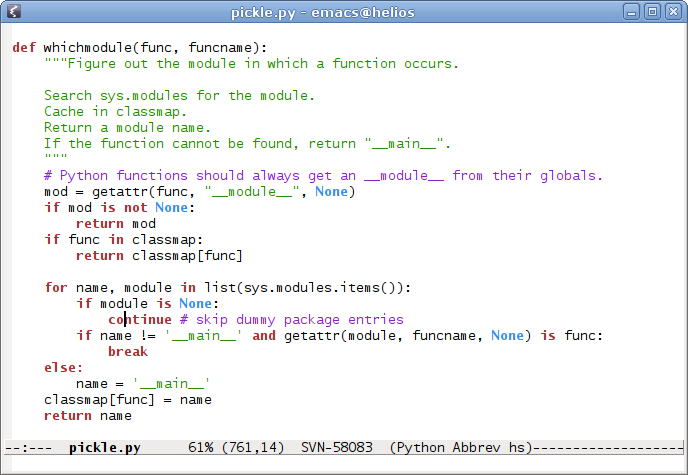 I use the emacs-goodies-el package on Ubuntu to get color-theme, now. Thank you for the prompt response Alexandre. That worked out great. Thanks for providing this version, Alexandre! Keep up the great work. In .Xresources made the display even better. Found out: I had to run emacs-snapshot-gtk instead of emacs. I’m running it in edgy. Seems to be fine. One odd thing: when I change Monospace-13 to Monospace-8 in my .Xresources file, nothing changes in emacs… any ideas? If that doesn’t work, then I ain’t sure what could be causing the problem. Is there a way I can use the stuff you have to create a dapper package. For whatever reasons, I am limited to using dapper at work, although I experimented with edgy and I loved your package (I had been trying to get emacs-xft running and it was never this beautiful). Mario, I am currently making a backport for Dapper. It should be out by the end of the week. Stay tuned! Alexandre, thanks for your great work! The packages work flawlessly. Awesome. Thank you for the dapper packages, using them now. Any possibility of creating a x64 package in your repository? Dennis, maybe. I got an AMD Athlon64, so I could compile it. However, it would require, from my part, some extra work (eg. installing an amd64 kernel and rebooting every time for compiling the package). If I get more requests, I will probably start to support it too. If I remove .Xresources the line “Emacs.font: Monospace-13″ then it is fine but the editor font is ugly. I have tried to refresh the font cache. All the fonts seems to be there. Where Emacs expects these fonts to be ? If that doesn’t work, I will investigate the problem further. Indeed the installed version was the wrong one. I re-installed yours. It works fine. Thanks so much. Any chance of making a 64bit version? Thanks for your efforts, I really like the new look of emacs. But unfortunately I have a problem: I cannot enter german “umlaute” (ö,ü,…) anymore. Typing them only displays rectangles, typing them after starting emacs via “emacs -nw” produces a segmentation fault. Can someone help? Dierk, this version of Emacs supports Unicode input, at least it’s supposed to. The trick is to use the C-x 8 key sequences, instead of the usual compose-key. For example, for ‘ü’ you type C-x 8 " u. To see all the non-ascii characters you can type with C-x 8 prefix, type C-x 8 C-h.
What is the color theme you are using in the screenshot? Using Dapper, work flawless Thank you so much! Istvan, it’s a custom color theme I made myself. You can find it in the Subversion repository of my Emacs configuration. It’s working great on kubuntu dapper! Thanks! At first the colours weren’t working properly (there was a different background colour when there was no text), but setting up kde as described on the emacswiki fixed everything. Do you know how I can generate a package that contains the debug symbols? I’ve got a repeatable segfault and I’d like to get a meaningful backtrace using gdb. sfp, the packages are compiled with the debug symbols, but stripped just before building the archive. Therefore, you just need to comment out dh_strip -a in debian/rules. Hopefully, it should work has intended, but I may have forgotten something. Also, keep in mind that Emacs is linked to libraries which are stripped, so you will still see some (no debugging symbols found) message from gdb. Really the best way would to checkout Emacs from the upstream CVS repository, compile and then test. The instructions to do so are on the EmacsWiki. I’ve written 2 posts about emacs last week, but after they were finished, I found something more to improve. So I deleted the previous two and summarized all the pieces of tips mainly for Xft font configuration here as one post. I did the install as per your guideline but it always tell me that ‘no match for monospace 13 found’ Can you kindly help…. Below is the error message..
For some reason, this build (on dapper) breaks python syntax color highlighting if the source file contains a \”\”\” string. The same file works correctly in standard ubuntu emacs. Yes, tibbe. I am well aware of this problem. The simple solution is to use the Python mode that comes with Emacs, instead the one the Python project maintains. Karim, makes sure you installed the package from my reposistory. You are probably still using the package from Ubuntu repository, which doesn’t have the capability to load FreeType fonts. Now, does anyone know how to get this working on RHEL? Now that I seen it work, I can’t go back! After installing this package, the only font I ever get is some proportional font — it doesn’t use the font specified in .XResources, and setting a font from within emacs does not help either. Any clues as to what’s wrong? Arve, have you closely followed the instructions? If the proportional fonts you got are anti-aliased, then you’re on the right path. Try to rename .XResources to .Xresources; run xrdb -merge .Xresources; and then launch emacs-snapshot-gtk from the command line. If that doesn’t fix the problem, post your .Xresources file and any error message you get. My .Xresources (which was named correctly) was lacking a trailing newline. Now it works, and I have pretty fonts in Emacs too. Thank you so much. On the RHEL system I have compiled the emacs-unicode-2 branch and it kind of works, but some faces do not use the font specified in .Xresources. On my Ubuntu system with your package, this is not a problem. Would you have some insight as to what is the problem and how to fix it? Alexandre, if I can’t use the Emacs python mode but need to use the Python project one for other reasons is there a way to hack around this? Is it specific to this build or XFT rendering in general? As a Kubuntu user, I’ve switched to Emacs 23a from Vim 7.0 for a couple of months. The new features of Emacs23a, like better UNICODE support and XFT things, are really amazing. I really like the color theme you posted here. It looks great in python-mode. Good Job. The patch came from python-mode’s tracker on SourceForge. I noticed some details of your windows decoration. HuMin, no. This is actually Metacity, the default window manager of GNOME. The theme is a mix — LegacyHuman’s window border with Silicon’s controls. Both are installed, by default, in Ubuntu. I would like to update the edgy packages for Xft goodness., pretty emacs. Your pretty emacs is great! Thanks! BUT I have an ugly menu font and I cannot change it. Any ideas? I have ubuntu 6.10, emacs and emacs-snapshot-gtk (from your site). I am using the Xfce environment I tried the following .Xresources menu-related entries (with no success): Emacs.pane.menubar*font: Monospace-10 Emacs.menu*.font: -*-bitstream vera I did remember to put a LF at the end of file, reload Xresources after every change etc. Thanks for providing the packages. I never managed to get this stuff working for myself, so I’ve been waiting (for ages) for someone to properly package this version of emacs. And you’re the man ! Worked great! This was a thorn in my side. Thanks. Hi, Thanks for the package! I have a question: when I start “normal” emacs with a filename: “emacs some_dir/some_file.txt” it will open that file. If I do this with “emacs-snapshot-gtk some_dir/some_file.txt” it will not open that file, although emacs will be in “some_dir” as the working directory. How can I change this behaviour to the “normal” one? Stefan, any Emacs versions should have, as you call it, the “normal” behavior. Please check your configuration and try run Emacs with the -Q flag (e.g. emacs -Q some_dir/some_file.txt). If this doesn’t fix the problem, I recommend you to send a bug report to GNU about it. Thanks, that seems to be my fault. It works with -Q and so it seems to be something in my config file. I will check this. Thanks. Thanks very much for making this emacs package. I have tried various strategies to get the antialiasing to work (as have many others in the ubuntu forums) and yours is the first method that has worked flawlessly on my system. Thanks very much for the package. However, I found that I can’t have black background anymore. For example, color-theme-white-on-black in my .emacs file only gives me white background. Any idea? Thanks. Thank you for the effort put into this, it looks great! I had always been put off by emacs’ font support, until now. Thanks for these packages ! Works fine on a current Feisty install. However, it doesn’t seem to play well with aspell with some languages that have accented characters. I have problems with my native language (Portuguese) using the brasileiro or the portugues dictionaries. It looks like the problem is that the aspell dicitionary is in iso-latin-1 and the text files are in utf-8. I am running feisty beta. Emacs 21 works well with these dictionaries, but it uses special spell.el, flyspell.el, and debian-spell.el files from the dictionaries-common package that refuse to compile for emacs-snapshot (it says: install/dictionaries-common: Skipping byte-compilation for emacs-snapshot, while installing). Any hints on how to get spell working? Can I have your theme.el file that is seen here: http://peadrop.com/files/emacs-color-theme.png Also, how do I load from my .emacs? Pardon the silly question, but is this post describing a patched XEmacs, or emacs that has some compiled-in GTK emulation of a terminal host, freeing it to run as XEmacs does, outside a gnome-terminal session? Apfan, my theme.el is, here, in my Emacs configuration repository. Just look at emacs.el, to know how to use it. Jeff, this the GTK version of GNU Emacs, compiled with XFont and Unicode support.